America has struggled with the question on whether it is okay for civilians to own a gun, and the states must have reached a conclusion that owning a gun might be a good thing after all. 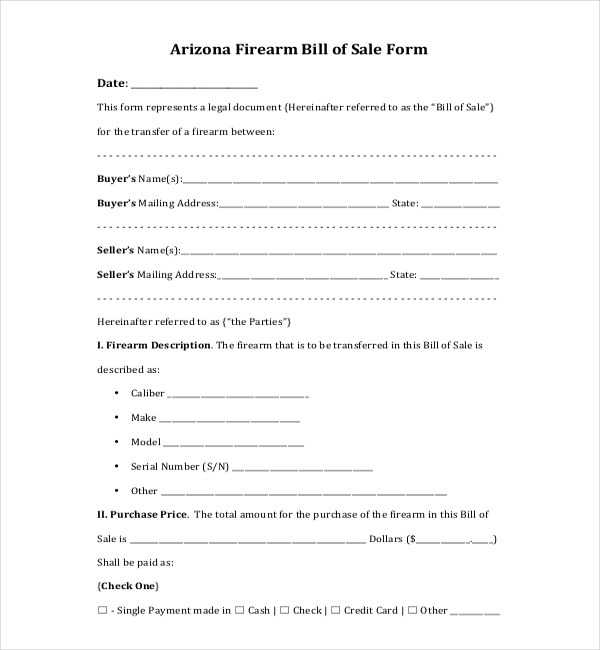 If you are dealing in selling of firearms, it’s important to issue a Bill of Sale Form to indicate that you have willingly transferred the ownership of the item to the buyer. If you own a gun, and you would like to sell it to someone who needs it the most, the buyer may require you to provide him or her with a private bill of sale for firearm. Usually, the significance of this template is that it will act as evidence that there was a transaction between two parties based on a given set of agreements. Many people who own guns do not really want to own them anymore. They are more than willing to write down a gun bill of sale and do away with the gun in their possession. 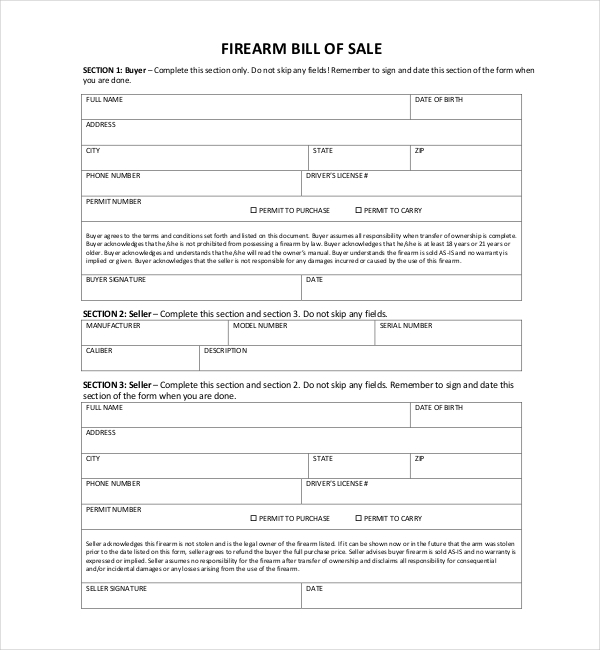 If you are one of those who would like to sell out their gun to a willing buyer, you will have to create this form to transfer ownership. The details about everything you own is confidential and delicate, especially if you live in Arizona. Whatever you sell must go along with a bill of sale. 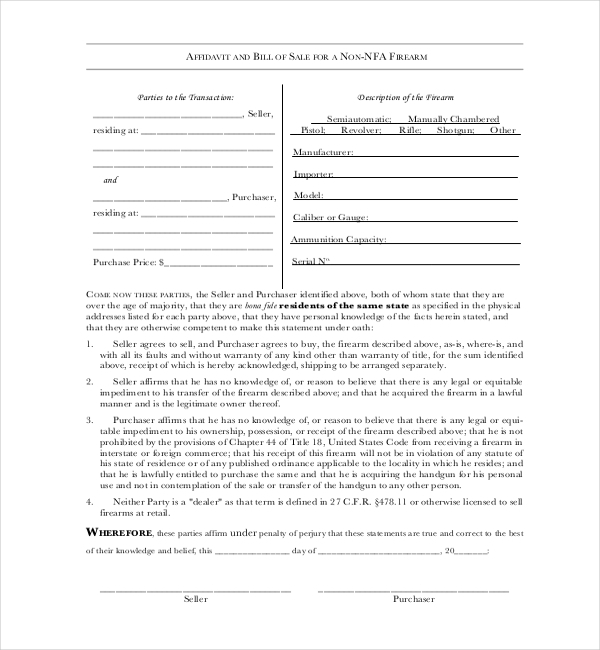 Because of the content of this form is gun ownership, you need to fill it carefully without making any mistake. The purpose of this form is to transfer ownership and title with ease. Florida residents do own guns; it is not really a bad thing. In fact, everyone should own one for self-defense, or why else would there be a need for firearm bill of sale? The purpose of this template is to help you transfer the ownership of your gun to the new willing buyer with ease. Download the template and use it for free. The Georgia Firearm Bill of Sale is a useful tool for writing your sales agreement. Besides, it saves you the need of having to create the template from scratch. The best thing about this template is that you do not have to customize it. In fact, you only need to download it, print it and fill it in with relevant details about your item. Owing a firearm does not mean you are breaking the law. 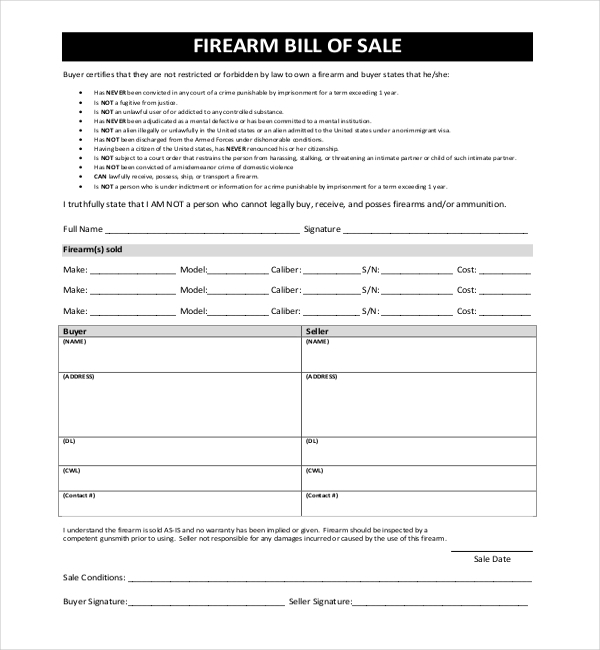 However, if you would like to sell yours, the first thing you do is to download and fill in a bill of sale from NC pistol. 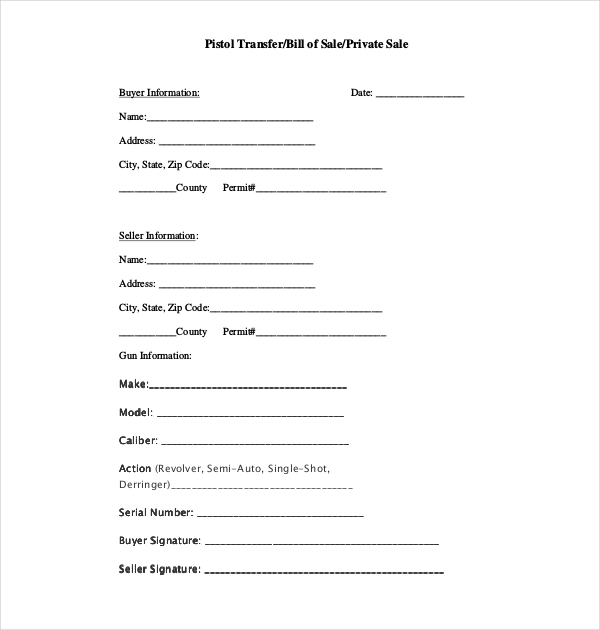 The purpose of this template is to indicate that you are not only willing to sell the gun but also you are also willing and able to transfer its ownership to a new buyer. Many residents in South Carolina own guns. 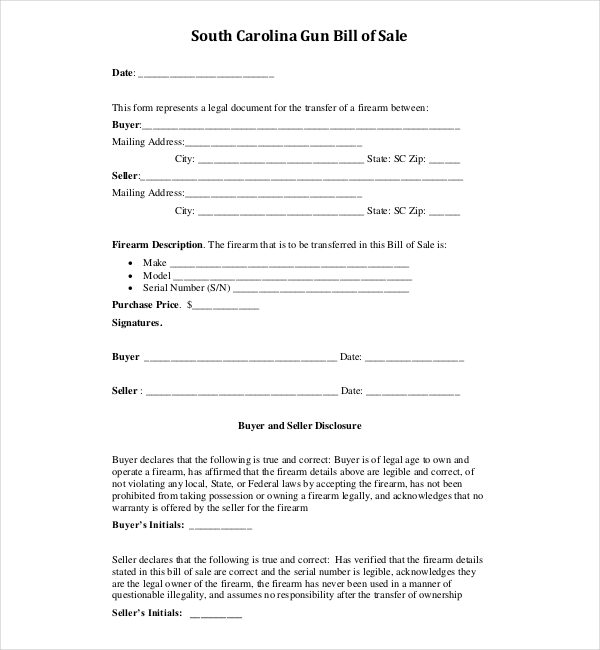 If you are one of them and you would like to sell yours in a willing seller willing buyer agreement, consider giving the seller a firearm bill of sale from South Carolina. Many buyers will not accept a gun if they cannot have the rights to own the gun fully. Download the form for free and use to make the transaction legal. People have painted a bad picture about guns. Regardless, they are useful tools that can help us in self-defense. On the one hand, people who own guns want to keep them. One the other hand, there are those who want to sell their guns. 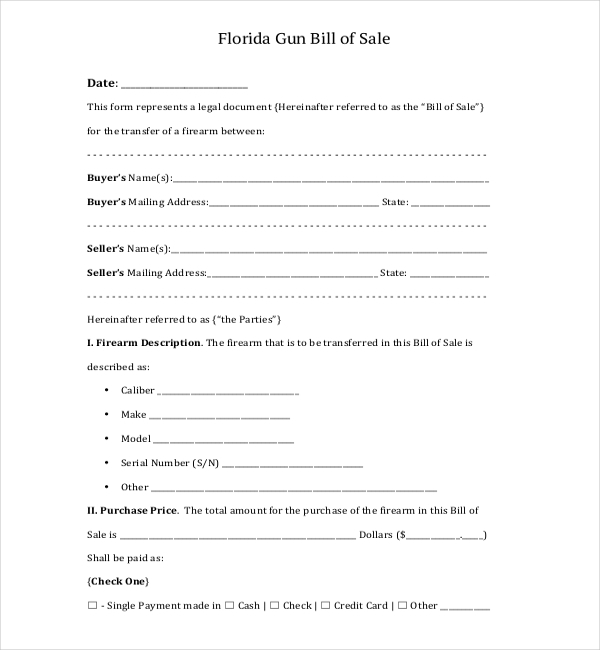 If you are a seller, you might want to consider a pistol bill of sale form to make the transaction successful. The transfer of firearms should be legal. Guns are not bad things because they have a positive use after all. However, if you are getting into the willing buyer willing seller deal, you must prepare a bill of sale for transfer of firearm. You must transfer the ownership of the gun for the transaction in question to be legal. The form must have accurate information. It must reflect your personal details as well as the details for the items you are willing to sell. The template must be clear and easy to understand. The template must have accurate information. 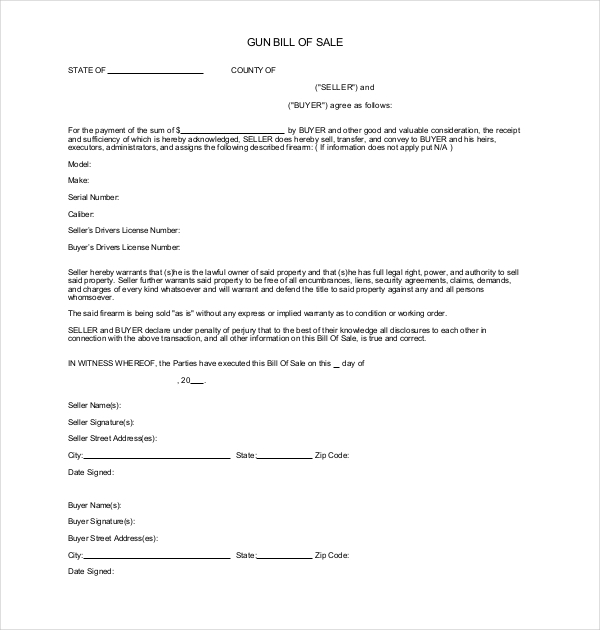 The purpose of a bill of sales form is to make the transfer of a product from a willing seller to a willing buyer easy and professional. 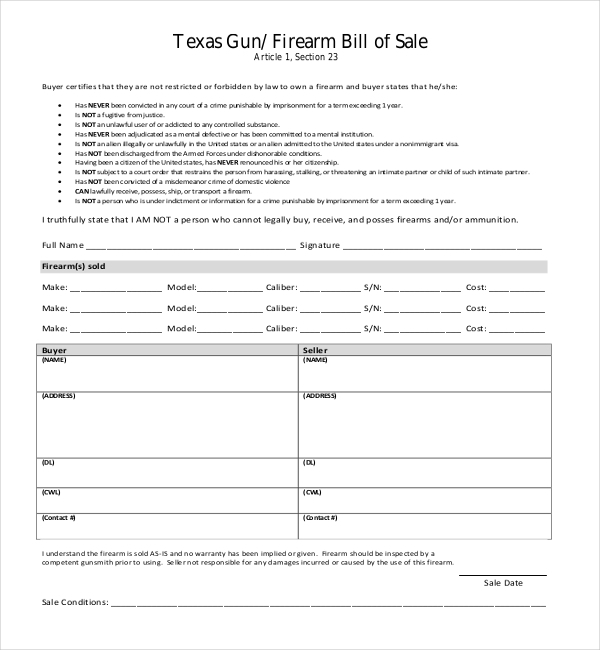 Guns are delicate products; you must complete the transaction by giving a bill of sales template to signify that you agree that the new owner possesses full rights of ownership of the items in question.